Feeling jealous lately? Just throw a water bottle across an empty basketball court. Feng Teng may think he’s super stealthy in his pursuit of Shan Shan, but he really is wearing his heart on his sleeve. It doesn’t take much for him to reveal his true feelings for her. Of course, he reveals it to Zheng Qi, and not Shan Shan. Step up your game, Feng Teng! Maybe it’s time to move away from the aloof, cool guy act or you’re going to lose her real soon. As Shan Shan is doing some late-night pondering, she thinks about the object of her affections, Zheng Qi, and wonders if fate brought her to Shanghai so that she can meet him. But all of a sudden, she randomly thinks of Feng Teng and the time they’ve spent together lately. Mood killer! Or maybe not. The following days, she continues her daily routine of eating lunch in Feng Teng’s office and helping him pick out the foods he doesn’t like from his lunch. Since she can’t be rolling her eyes and cursing him (he is her boss after all), Shan Shan resorts to playing fighting video games at night to alleviate her frustration towards him. Only punch the video game Feng Teng’s face and not his real one, please. Feng Teng’s secretary informs him one day that Shan Shan will not be making her usual appearance at lunchtime because she’s come down with a bad cold. Zheng Qi just so happens to be hanging out in Feng Teng’s office when he gets this news, so he takes the opportunity to get the truth outta him. Zheng Qi asks Feng Teng if it’s true that he really has been eating lunch with Shan Shan every day in his office, and if he has actually developed feelings for her. When Feng Teng dodges the question and plays up his trademark cool guy persona, Zheng Qi reminds him that these daily lunches with her boss may not be so great for Shan Shan’s reputation. He casually insinuates that this sudden cold may have come as a result of that. Ya think? Shan Shan is going around the office acting like she’s super sick, wearing a mouth mask and fake coughing everywhere she goes. She grabs her instant noodles (in a Hello Kitty cup!) and returns to the rooftop balcony that’s right next to Feng Teng’s office to eat. Once alone, she takes off her mouth mask and celebrates her escape from the daily lunches with the boss. Feng Teng, of course, sees her and is watching her as she happily dances around while eating her instant noodles. Although he’s disappointed that she’s not eating lunch with him, he’s happy just to see her on the balcony again. Despite the fact that she didn’t eat lunch with Feng Teng, one of Shan Shan’s coworker is being super rude and cold towards her. The coworker keeps referring to how Shan Shan only got the job at Windgroup because of her connections, and not because of her own ability. Mind your own business, lady! After work, another of Shan Shan’s coworker tries to cheer her up and say that it’s not a bad thing to be close with the boss. When she asks Shan Shan why she keeps eating lunch with him if she doesn’t want to hear people gossiping, Shan Shan is too embarrassed to say that she’s only there to pick out foods from his lunches. Instead, she tells her coworker that she’s there because Feng Teng gave her a secret task to complete during that time. On her way home, Shan Shan sees Feng Yue going into her soon-to-be-opened bookstore. She follows her there and expresses how happy she is to have run into Feng Yue. You see, there’s still the little issue that is the daily lunches that haven’t been resolved. Shan Shan mentions she knows that Feng Yue was probably busy in Europe the past month and must have forgotten to tell Feng Teng to stop giving Shan Shan the lunches. Feng Yue immediately realizes that the Europe thing was a lie that Feng Teng made up and plays along. While Feng Yue and Shan Shan are trying to settle this whole lunch issue, who should show up at the bookstore but Feng Teng. When Shan Shan sees him there, she quickly says hi and bye and runs out of there. Feng Teng follows her outside and asks about her cold. Having forgotten about that lie she made up, Shan Shan immediately amps up the fake coughing and tells him to stay away from her because she doesn’t want to get him sick. Before she gets the chance to run away from him again, Feng Teng tells her to not worry about helping him pick out foods at lunch anymore, and should concentrate on her health and work. Hearing that she’s officially freed from food-picking duty, Shan Shan is over the moon as she skips home. But when she thinks about the last time that she had lunch with Feng Teng and how it was pretty fun, she suddenly feels a little empty and disappointed that the lunches are over. Ooohh, is Shan Shan starting to like Feng Teng? At work the next day, there’s a mistake with one of the reports from the finance department and the rude coworker from before blames it all on Shan Shan. Not only does this awful coworker blame it on Shan Shan when it was clearly her own fault, she doesn’t shut her damn mouth and keeps talking about how Shan Shan doesn’t deserve this job. Shan Shan has no choice but to stand there and listen to all these nasty things being said about her. Poor girl. Shan Shan takes her lunch with her to her usual spot at the balcony. But she’s so upset from what happened earlier with her coworker that she has no appetite. 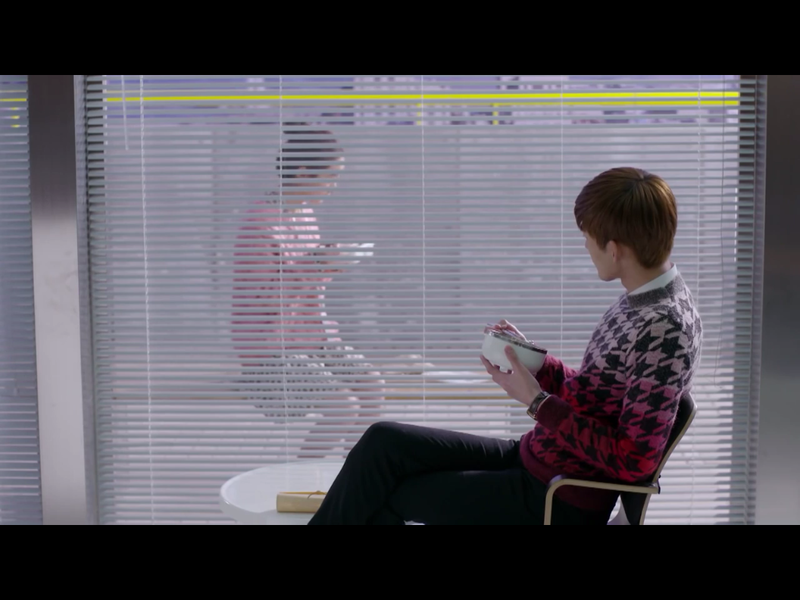 Feng Teng was already sitting next to his window, waiting for her. Shan Shan attempts to eat her lunch, but she just can’t. Feng Teng watches helplessly as she cries into her food. 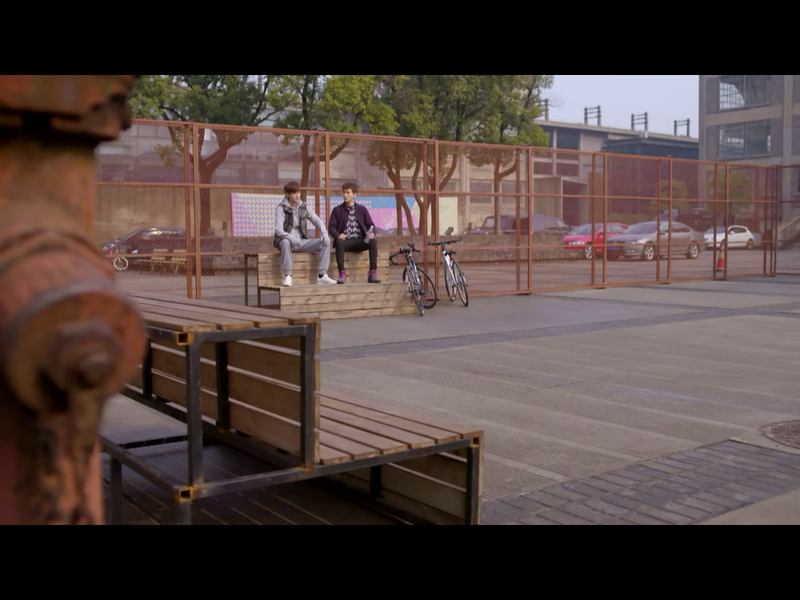 Finally, she leaves and Feng Teng is left to wonder why she is so sad. Tears are not a good condiment. Shan Shan doesn’t back to her office after leaving the balcony, and instead sits by herself in the empty stairwell, crying. Zheng Qi stumbles across her crying and tries to comfort her. Feng Teng had also left his office to maybe look for Shan Shan, and sees Zheng Qi hugging and comforting Shan Shan in the stairwell. I don’t know if I’m on Team ZQ or FT right now! After witnessing this, Feng Teng quietly retreats to his office where he finds out from his secretary that the finance department head was blaming Shan Shan for the mistake on one of the reports. Zheng Qi takes Shan Shan out for coffee to take her mind off of things. Shan Shan blames herself for being too simpleminded and easily bothered by what other people said about her. Zheng Qi doesn’t allow her to talk badly about herself, and reminds her that she needs to just keep being Xue Shan Shan. Shan Shan’s mood is instantly lifted because she thinks Zheng Qi is flirting with her. Can’t blame her; there’ s just something so charming about Zheng Qi! Later, when Feng Teng and Zheng Qi are out riding their bikes and playing bball, Feng Teng directly asks him what he was doing in the stairwell at work today. 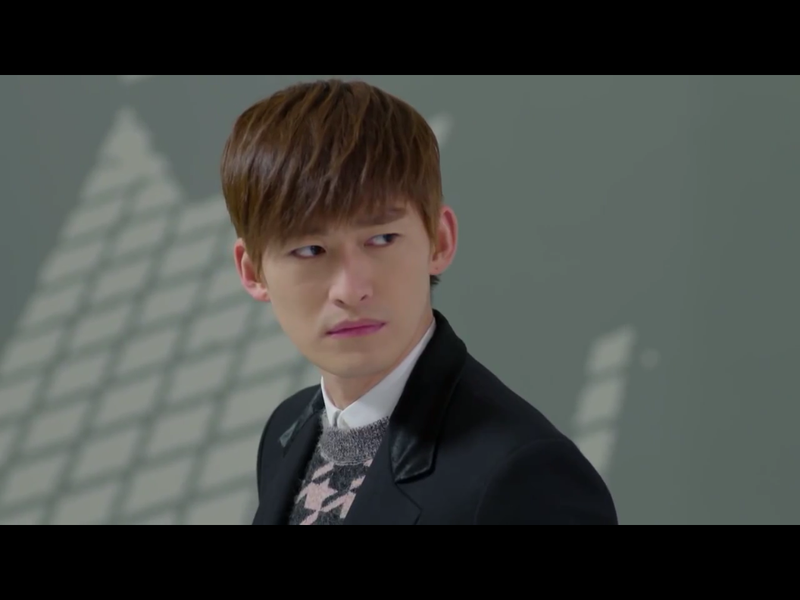 Zheng Qi figures that Feng Teng saw him and Shan Shan there, and makes fun of him for being jealous that they were acting so close. When Feng Teng refuses to admit that he’s jealous, Zheng Qi keeps pushing his buttons by saying that he and Shan Shan did more than just hug; they even went on a coffee date! Hearing this, Feng Teng can’t hide his jealousy any longer and hurls his water bottle across the ball court. No denying that jealousy now. Zheng Qi lectures on him for not realizing that he’s the one causing all the problems for Shan Shan at work. Feng Teng finally admits to him that he does like Shan Shan because she’s different from all the other girls that he knows, namely that she’s very innocent and cute. But he’s scared that if they do date that she will change because he’s the boss. 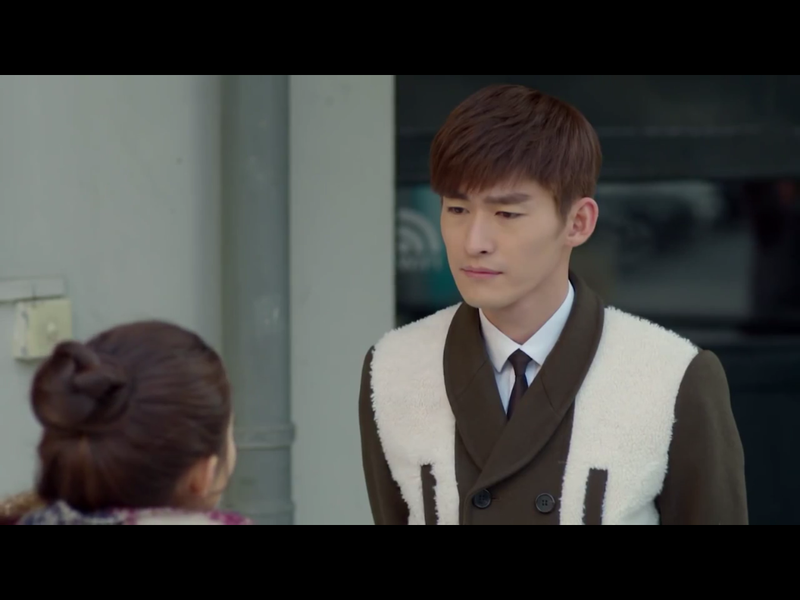 Zheng Qi advises Feng Teng to let go of his reservations and not worry about Shan Shan changing, and that if he really does like her that he should go and pursue her. Go, Feng Teng, go! After the very stressful day at work, but also a very nice coffee date with Zheng Qi, Shan Shan is still working at the office late into the night. Feng Teng is also at the office, and goes downstairs to see her still there. While he’s watching her, Du Fan arrives to pick her up. Feng Teng wonders to himself who this Du Fan guy is, and probably how much more competition he has for Shan Shan. Already not liking Du Fan. The next day, Shan Shan and her coworker friend both find out that they have passed their trial period at Windgroup and have successfully become official employees there. Yay! While she’s celebrating with her friend, Shan Shan receives a text from Feng Teng congratulating her on becoming an official employee. Whoooo, Feng Teng must have taken Zheng Qi’s advice and is making his move! After talking with Shan Shan at the bookstore, Feng Yue asks Feng Teng why he’s still sending her lunches. Feng Teng plays dumb like he didn’t know that he was supposed to stop them. 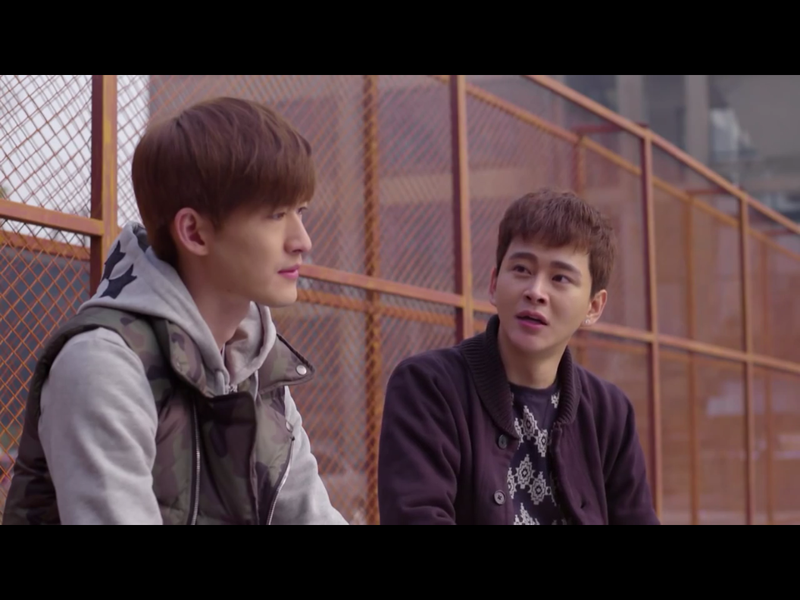 Feng Yue sees right through his act, and tells him that no wonder he wasn’t interested in any of her friends that she tried to set him up with at the party. Shan Shan’s parents call her while she’s working late at the office, and asks if she’s dating anyone and how things are going in Shanghai. She reassures them by lying that she’s really happy at work, and that her coworkers there are very nice to her. Her parents seem super cute! Du Fan and Shan Shan’s roommate are secretly dating(?) after they found out that they were actually flirting with each other on social media all this time and didn’t know. Don’t really care because the roommate is so annoying, but Du Fan sure changed his mind fast about Shan Shan.